It has been a struggle for me to post this. 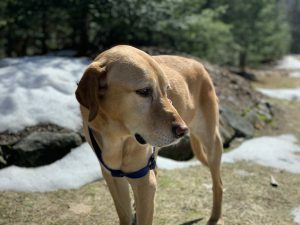 Cooper’s health took a turn two weeks ago. He hadn’t seemed right for a few days after a very good health exam in mid March. The only issue then were his liver numbers. After he started acting a bit off, we tested last Monday and they had tripled since the exam. An ultrasound Thursday lead to a diagnosis of lymphatic and liver cancer. I’m a mess but working to get into strong caregiver mode. Dr Henshaw our vet said it looks like we have weeks with him left. Right now, Coop is mostly himself – curious, wagging, smiling, eating, etc. I apologize for not having all of your blog posts read during break. I will be doing that this week. And please contact me if you need anything or have any questions related to the Brief, etc. @michael I’m incredibly sorry to hear this. Sending you lots of empathy and caring thoughts. Please enjoy your time with your boy. @michael I’m very sorry to hear about Cooper’s health. Luckily you noticed the differences in his behavior and were able to get him to the vet. Thinking all good thoughts and sending them to you and Cooper. Never an easy time — sending virtual hugs to you and to Coop. @michael I am so sorry, I nearly teared up reading this — being a dog mama myself, imagining the difficulty of this situation is almost unbearable. I am sending all my warm wishes, please take care during this time and soak in every moment. @michael I’m so sorry…I can’t imagine what you are going through. Family first and Coop is family. Spend time with Coop and don’t worry about us. Prayers and hugs to you and Coop. I’m so sorry. Enjoy him. I’m sending a virtual hug and ear scratch! @michael Hope you are able to spend lots of time spoiling your beautiful Cooper with lots of pets and treats. Rub Coop’s belly for me. I agree with Karen. . . Family first. I’m so sorry to hear this. Please prioritize time with Cooper. Sending you caring thoughts. @michael – So sorry to hear about Cooper. Of course you must take the time to take care of him and yourself. Sending many good thoughts your way. Sending good vibes to you and Cooper. @michael I am so sorry to hear, that must be so hard. Take care of yourselves. @michael I’m so sorry to hear about Cooper! He’s lucky to have you and I’m sure he knows that he is loved! I hope you get lots of good walks in and are able to enjoy your time with him. So sorry you got that news. Coop looks like a real champ and sweetheart! Michael, I’m so sorry to hear this. Fitz B and I are sending warm and healing thoughts. @michael I am so sorry about Cooper. Pets are the very best parts of us. Take care of him, yourself and your family – your virtual class will be here. @michael I’m so sorry to hear about Cooper. I don’t have much time left with my dog either, so I know how you feel. Enjoy every minute together, and take care of yourselves!